Founded in 1982 as a Specialty Manufacturer of Grinding Machinery, we have grown to become the most diversified builder of Tape Microfinishing Machinery in the world. From our humble beginnings in the basement of our founders home, we have expanded twice and currently have a modern machining and assembly facility in Youngstown, Ohio. We own patents relating to microfinishing and we are constantly striving to develop new and better processes to help our customers improve quality and productivity. In our early days, we built only 4" and 8" abrasive width retrofit machines designed to be used for finishing Work rolls used in the Strip Processing Industry. These machines could be easily mounted on existing lathes and roll grinders. The Magnetic Media, Aluminum, Plastic Film and Paper Industries were prime candidates for this latest method of finishing rolls. Not only did The Gem Process dramatically increase productivity, but it also greatly enhanced the quality of the Strip Material. In the late 1980's, we took our basic Microfinishing Process and began developing production machinery that could be used in many different industries. We have designed and built Through-Feed and Centerless Plunge Systems for Microfinishing of cylindrical components. We also developed a variety of Center=Driven Microfinishing Systems for components that can be supported between centers. The Automotive industry was the first to see the benefits of The Gem Process, and other industries rapidly followed. Manufacturers of hydraulic rods, compressors, pumps, photocopiers, shock absorbers, transmissions and other parts that mate with a seal or bearing are now pursuing the advantages of Microfinishing. 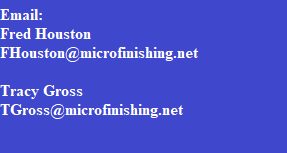 The benefits of Microfinishing are enormous when compared to the cost of the equipment. Improved efficiency and durability are only tow of the numerous benefits of The Gem Process. We are a customer-oriented company dedicated to assisting our customers in determining the most efficient and productive method of achieving consistent, repeatable and cost-effective finishes on their components. With over 900 machines in daily use in 30 countries around the world, we have solved virtually all finishing problems, from achieving a mirror finish on rolls that make X-ray film to eliminating bearing noise on computer printer shafts.